Updated 2015-08-18 to include information on AlienSpy transitioning to JSocket v1.0. 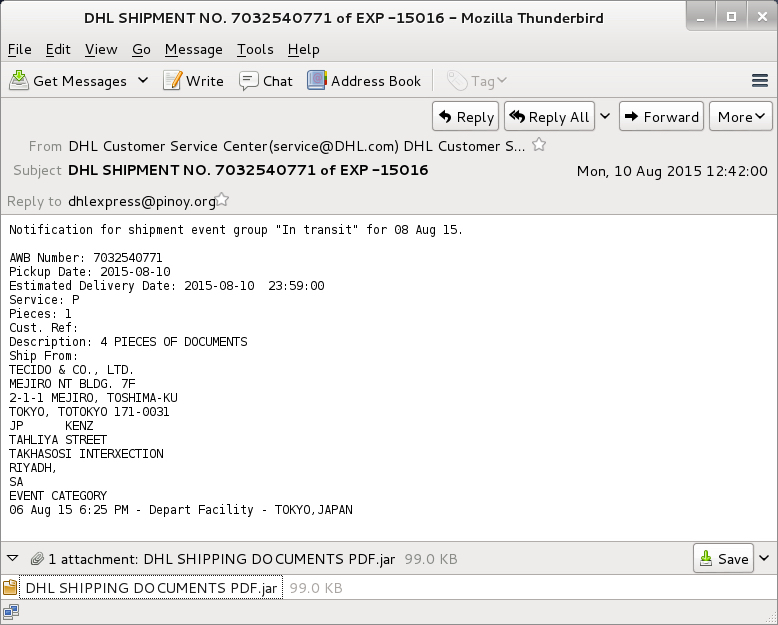 Since mid-July 2015, I've noticed an increase in malicious spam (malspam) caught by my employer's spam filters with java archive (.jar file) attachments. These .jar files are most often identified as Adwind. Adwind is a Java-based remote access tool (RAT) used by malware authors to infect computers with backdoor access. There's no vulnerability involved. To infect a Windows computer, the user has to execute the malware by double-clicking on the .jar file. Of course, you have to have the Java Runtime Environment installed, which many people do. I previously associated Adwind with targeted phishing attempts in limited amounts. I had found very few examples of non-targeted malspam using this RAT. However, we're currently seeing enough Adwind-based malspam to ask: Is Adwind now another payload for botnet-based malspam? Adwind originated from the Frutas RAT . Frutas was a Java-based RAT discovered by Symantec from underground forums in early 2013 . By the summer of 2013, the name had changed to Adwind, and signatures for Adwind-based malware were implemented by anti-virus companies . In November of 2013, Adwind was rebranded and sold under a new name: UNRECOM (UNiversal REmote COntrol Multi-platform) . Throughout 2013, we noticed a few occasions of Adwind used in phishing attempts. 2014 saw an increase of Adwind/UNRECOM malware used in phishing campaigns targeting "U.S. state and local government, technology, advisory services, health, and financial sectors" . By April 2015, a new Adwind/UNCRECOM variant called AlienSpy was widely reported, and this new variant included Transport Layer Security (TLS) encryption for command-and-control communications. These TLS communications involve certificates. EmergingThreats posted a signature for Adwind-based certificates in March of 2015 , and Fidelis CyberSecurity Solutions published an in-depth report on AlienSpy the following month . 2015-04-10: AlienSpy domain suspended by Godaddy shortly after a report on this RAT was published by Fidelis . 2015-04-19: JSocket.org registered through eNom. 2015-06-23: JSocket.org's first blog entry stating the project started on 2015-06-23 . 2015-07-10: Another entry (now removed) states AlienSpy would stop on 2015-07-11, telling AlienSpy users to update to JSocket. As recently as 2015-08-18, a site called Rekings currently shows its AlienSpy entry tagged as JSocket v1.0 . 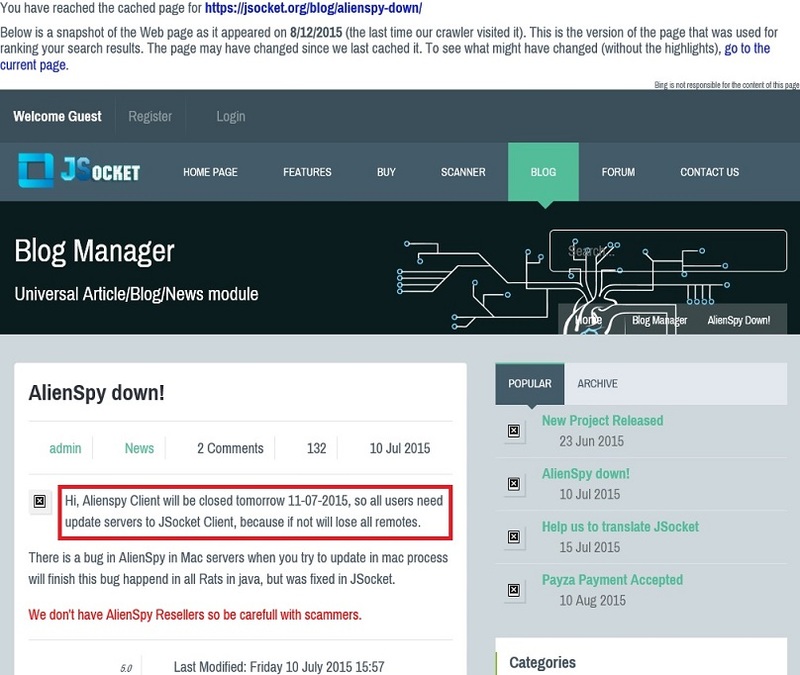 Shown above: Blog entry showing AlienSpy transitioned to JSocket on 2015-07-11. 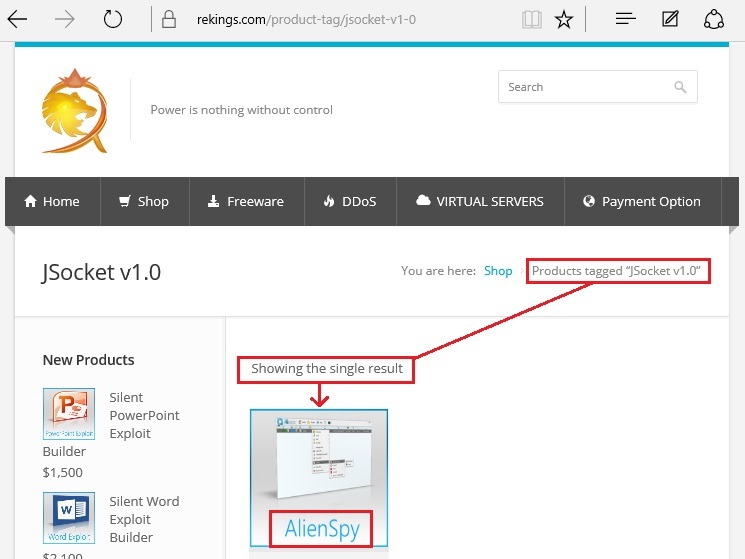 Shown above: At least one reseller has tagged AlienSpy as JSocket v1.0. The naming progression appears to be: Frutas -> Adwind -> UNRECOM -> AlienSpy -> JSocket. 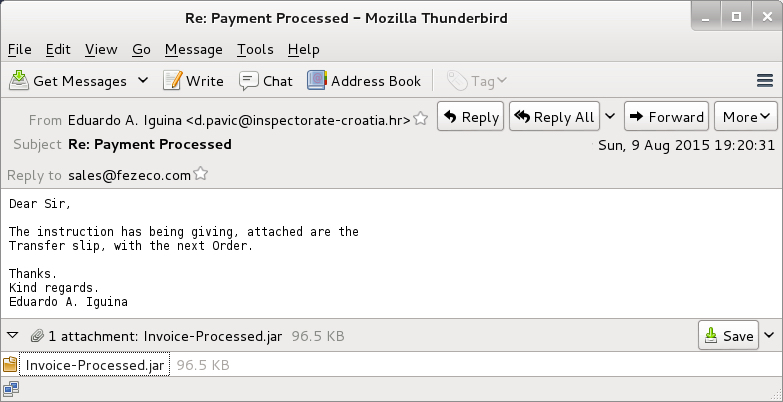 From what I can tell, it's all been Java-based malware sent as .jar file attachments in phishing emails. Many people still refer to it as Adwind, which is how I see it identified most often. Not counting targeted attempts, I've found Adwind-based malspam maybe once every month or two. That changed in mid-July 2015. After that, the amount of malspam with Adwind increased dramatically. Currently, I see at least one Adwind-based malspam every day on average. 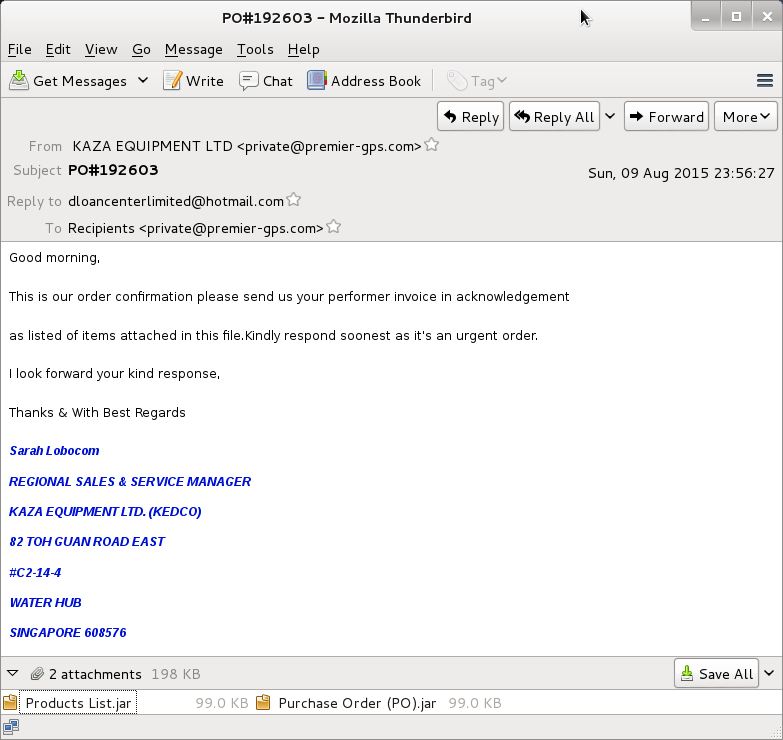 The frequency of this malspam along with the variety of subject lines, attachment names, and senders indicate Adwind is no longer limited to targeted attacks. Frutas/Adwind/UNRECOM/AlienSpy/JSocket (whatever you want to call it) appears to be another payload for botnet-based malspam. I examined a pcap from the last malware sample above, with command-and-control traffic on TCP port 1818. 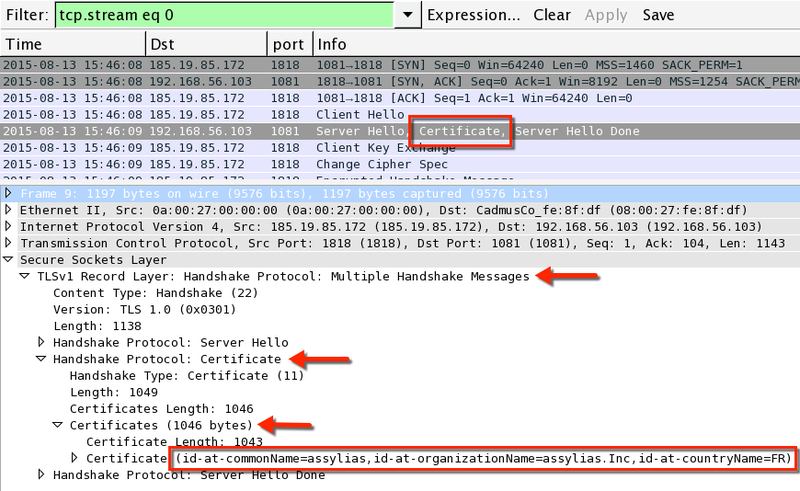 You can find the certificate associated with Adwind in Wireshark. First, follow a TCP stream with the traffic on port 1818. 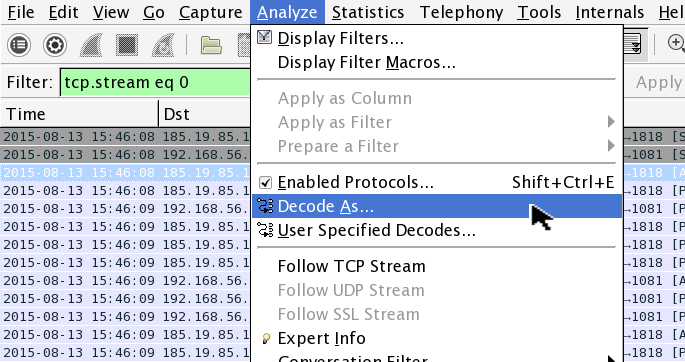 From the Wireshark menu, select: Analyze -> Decode As. In the window that pops up, select the Transport tab and scroll down to SSL, then apply. This still shows the same certificate information used since EmergingThreats tagged it in their snort signature from March 2015 . I saw the same certificate information used last week , and it continues this week. 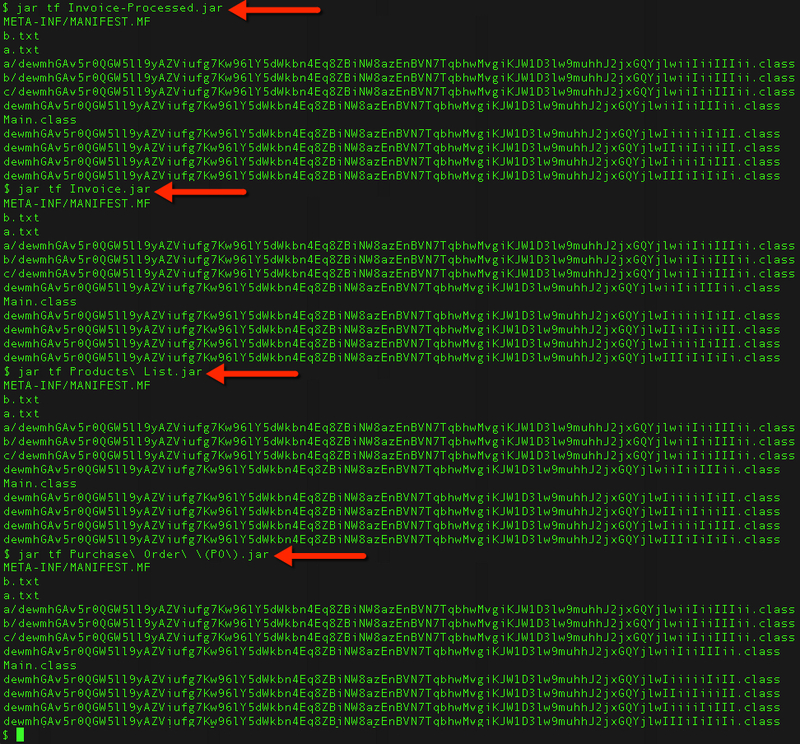 This malspam might all be from the same botnet, but I haven't had time to dig through the malware samples to confirm. Furthermore, my view is limited to whatever I collect from the spam filters at my current employer. I suspect other organizations with access to more data have better insight. 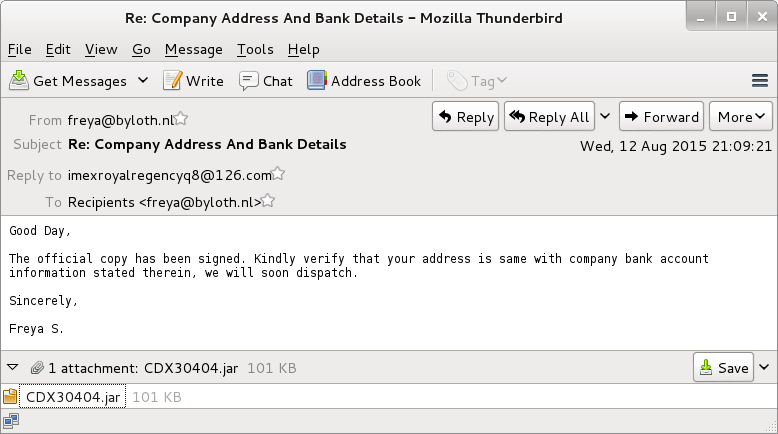 If any of you have encountered examples of this malspam, feel free to share in the comments.